The weather in the area is temperate, with temperatures varying, on average, between 12°C in the winter months and 32°C in the summer months. The area has little rainfall and over 3,225 hours of sunshine annually, making Chiclana one of the sunniest places in Spain. The average sea temperature is 17°C. Chiclana de la Frontera, south of the Bay of Cadiz, is the ideal location to discover this unspoilt region. You can visit the historic cities of Cadiz and Seville, discover the Sierras and the enchantment of Moorish Granada, sample the daily fresh produce from the local fishing villages and wine and sherry producing vineyards, and walk along the miles of golden sandy beaches while watching the sunset. The little island of Sancti Petri, languishing in the Bay of Cadiz, is surrounded by myth. It was here that Hercules completed two of his twelve labours, and the Temple of Hercules was built three thousand years ago. Only parts of the Temple’s foundations remain but Hannibal and Caesar both stayed at the Temple. A church now stands on the site of the Temple. Built at the end of the 18th Century the church was designed by the architects Torcuato Canyon and Torcuato Benjumeda and is the best example of neoclassical architecture in the province. Opposite the Island is 8 kilometres of one of the finest beaches in Spain. This beach is divided into two distinct areas. The first is the water front promenade offering a variety of excellent bars, fine restaurants and shops. The second part of the beach is untouched golden sand, which has achieved the coveted Blue Flag status for cleanliness and water quality. At the southern end of the urbanisation is Novo Sancti Petri a tourist and sports complex; encompassing Novo Sancti Petri golf course and clubhouse, tennis courts, shopping complex with many boutiques and a horse riding centre. Unlike many of Spain's coastal towns Cadiz does not rely on tourism as its prime source of income. Rather it is still a working port with a very relaxed atmosphere, and vibrant night life which explains its popularity as a holiday destination for many Spaniards. Thanks to Christopher Columbus, who began two of his major voyages from here, Cadiz became a major trading port, reaching its heyday in the early 16th century as the launching point for the journey to the new world. Cadiz was later raided by Sir Francis Drake, when he “singed the King of Spain’s beard” in a daring raid. In 1812 the country's first Constitution was declared here. The old city looks quite Moorish and is enchanting with narrow cobbled streets opening on to small squares. Many of the buildings reflect the city's overseas links. Jerez is a delightful town famed worldwide as the sherry capital of the world and the cradle of Flamenco. Sherry is one of the most famous wines in the world and it has been appreciated for centuries. This region boasts the right combination of climate and soil that give Sherry its distinctive characteristics. Many of its numerous Bodegas provide fascinating tours allowing you a glimpse of the art of making the world’s finest sherry. Three of the best known bodegas are Sandeman, Gonzalez Byass and Domecq. But not only Sherry is produced: Brandy de Jerez is noted for its extraordinary quality. controlled by a "Consejo Regulador" which certifies both the quality and the origin. Ripened in oak barrels used for producing Sherry, this Brandy is famous throughout Spain for its unique, subtle flavours. FLAMENCO: For more than two centuries Jerez has been famous for being one of the most important cradles of Flamenco recognized by the very best exponents of this art and by flamenco lovers everywhere. Nowadays, Jerez enjoys international prestige as the town of Flamenco. There are more than a dozen small flamenco clubs (peñas flamencas) which frequently house concerts and recitals. The horses of the "Baja Andalucía" have been admired since ancient times. The excellent pastures in the marshes and excellent climate combine to produce a perfect environment for breeding these horses. The Royal Andalusian School of Equestrian Art was founded in Jerez in 1973 with the aim of preserving and promoting classical horse training. Its headquarters is in El Recreo de las Cadenas, an elegant palace designed by Garnier in the second half of the 19th Century. But Jerez is not just Sherry, Brandy, Flamenco and horses: the Bull-fighting Art Museum, the Clock Museum, the Congress Palace and the well respected Zoo can be also explored in this gem of Andalucia. One of the Pillars of Hercules, created when he separated the continents of Europe and Africa, the Rock of Gibraltar sits at the southernmost tip of Europe. Surrounded by sea on three sides Gibraltar shares a land frontier with Spain and is at the crossroads of the Atlantic Ocean and the Mediterranean Sea. The Strait of Gibraltar is of immense strategic importance and throughout history has played a key part in battles to control the western Mediterranean seaways. Linked throughout its history with the sea, Gibraltar was the gateway to the invasion of Europe by the Moors in 711AD and is where Lord Nelson was brought after he was shot by the French at the Battle of Trafalgar. For the last 300 years Gibraltar has been a British dependency and has prospered as one of the busiest ports in the Mediterranean. When Spain handed over northern Morocco to the new kingdom in 1956, they kept this little enclave: the European Union’s own bit of Africa. Spain has controlled it since 1580. Ceuta is divided into two zones: To the east practically all the inhabitants are Spanish, and the feeling around you is all Spanish. As soon as you head west, coming closer to the border area, you spot the first mosques, the women you see more often wear traditional, conservative, Moroccan clothes. At the border, even on the Spanish side, you have already reached Morocco. Here you find markets where cheap contraband is sold, and then imported to Morocco through the magic of “baksheesh”. On the southern shore of the Straits of Hercules (now Gibraltar) where Hercules separated Africa and Europe in one of his twelve labours Tangier, the White City, stands at the crossroads of civilisation, where the Mediterranean meets the Atlantic Ocean. Stroll down alleyways of the Medina or old Arab town containing a pair of picturesque markets : the Grand Socco and the Petit Socco (the Spanish word for "souk"). The medina is a real one with narrow streets, houses in many different styles. As a tip when shopping avoid the fixed price shops as when you haggle you will only get a small reduction and still pay up to 5 times more than elsewhere. Medina Sidonia is fine example of an unspoilt, white hill-top town, which dates back to the Romans. The town was one of Spain's most important ducal seats in the 15th century; producing an admiral who led the Armada against England. Novo Sancti Petri and Costa de la Luz is ideal for all sports. Here you can enjoy first class venues in beautiful surroundings and top facilities without the crowds that are becoming a feature of the Costa del Sol. 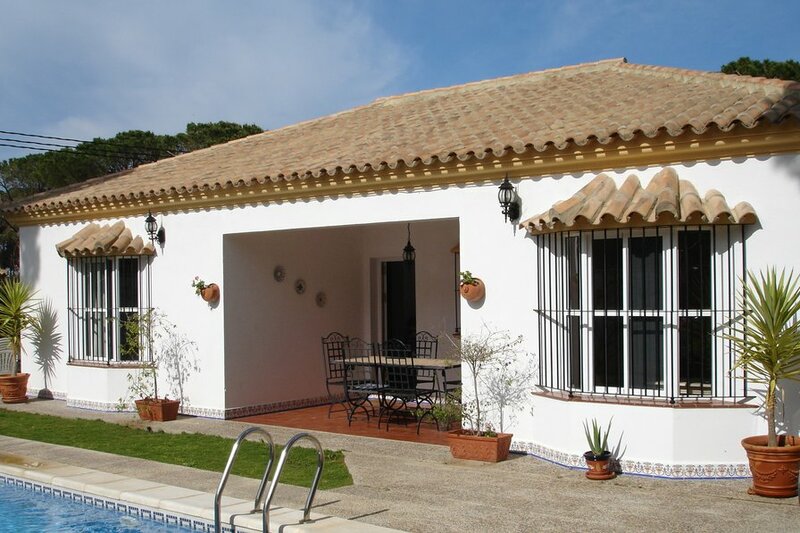 This area boasts championship golf course, the finest surfing, wind surfing and kite surfing in Spain and southern Europe and is unparralleled for its horse riding and unspoilt natural environment. Take the family to an Aquapark. Aqualand is located just north of El Puerto de Santa María on the main road to Jeréz. Open daily from 11.00 June – September. The facilities include a pool with a wave machine, Río Bravo, 2 kamikazes, Black Hole, 6 water slides, children’s pool, and the newest attraction, the Black Hole. There is also a restaurant, bar, children’s playground, first aid post and bus connection with El Puerto de Santa Maria and Jeréz. Golf can be enjoyed year round with local courses in Novo Sancti Petri and Jerez and courses at San Roque only a one hour drive away. NOVO SANCTI PETRI GOLF COURSE: set along a stretch of virgin coastline and just 3 minutes from Casa Alhambra, was the first one in Spain designed by Severiano Ballesteros. Offering two rounds of 18 holes (both are par 72) this 36 hole course is mostly set in parkland. The various water hazards, abundant vegetation, and bunkers, as well as the ocean breeze make playing these courses a challenge for players of all levels. Round A (Mar-Pinos) – 6097 metres (yellow tees): holes 1 to 9 offer wide fairways, two lakes and a water hazard. The most spectacular green is the 6th situated on the beach. Holes 10 to 18 are lined by Stone pine trees, offering a testing challenge. Round B (Centro) - 5846 metres (yellow tees): offers a variety of challenges with attractive lakes making challenging water hazards. Holes 10 to 13 offer magnificent views over the Atlantic Ocean. The course also includes a large practise area, Gokf Academy as well as restaurants and cafes. MONTECASTILLO GOLF RESORT, JEREZ: Designed by Jack Nicklaus, this 18-hole course is 6424 metres (Par 72) is considered as one of his best designs. It hosted the Volvo Masters tournament for 5 consecutive years to 2001. MONTENMEDIO GOLF COURSE: is an undiscovered treasure. Its 18 holes spread over the softly rolling “Dehesa” in an unspoilt rural area near Barbate, approx 45 minutes from Casa de Alhambra. SHERRY GOLF JEREZ: with its wide fairways and large greens provides a challenge for both amateurs and professionals alike while a choice of tee positions means the golfer may select a course suitable for his own level of play. BENALUP GOLF COURSE: is an environment friendly course not far from Vejer de la Frontera. The fairways and greens have been set up in an ecologically friendly way in this lightly forested area. The 18 hole golf course has many water obstacles. Benalup Golf has a splendid view of the “Laguna de la Janda”, an enormous plain, across which on a clear day you can see the coast of Africa. VALDERRAMA, near Sotogrande: is aa 18 hole, 6356 metres par 71 course designed by Robert Trent Jones, Senior, whom many consider the leading golf architect of his day. The course hosted the Volvo Masters in 2003. COSTA BALLENA CLUB DE GOLF: This course offers 18 championship holes, ideal for all types of golfer. Some of the holes run alongside the Ocean whilst the rest are laid to parkland, with lakes and strategically placed, cunningly designed bunkers. In 2002, 9 more holes were added to the original. There is also a 9 hole par three course, ideal for practising short shots and the perfectly complementing the golf school. These nine holes offer different distance, from 100 to 180 metres to test every club in your bag. CLUB DE GOLF CAMPANO: Located near Chiclana, Golf Campano presents the player with a very smooth 9 hole course near Novo Sancti Petri. This course has an excellent practice field and well equipped club. If you are a keen horse rider or just fancy giving it a try there opportunities all riders whatever your age or skill all over this area. Many riding stables combine different riding activities such as riding lessons, hour or day trips and even safaris lasting a few days. Hipica Novo Sancti Petri located less than a kilometre from Casa de Alhambra offers beach rides, riding lessons and many other activities. Overlooked by many surfers, this stretch of Spain's Atlantic coastline is little surfed, which means few crowds! Surfing can be enjoyed by all, particularly in the Autumn and Spring, and the Costa de la Luz, has the best and most consistent good waves for surfing and body boarding, particularly the beaches of El Palmar in Conil: an excellent place to start and perfect your technique. This area is located just a few minutes drive down the coast from Casa de Alhambra. Click the picture below for more information on surfing sites along the Costa de la Luz. The beauty of this coast is its diversity ensuring that the majority of the time you will be able to find a clean wave. The sheer variety is amazing from mellow or powerful beach breaks to long walled up reef and point breaks, this area has it all! The majority of the swell received in this part of Spain is ground swell. Most locals that surf this area come from Malaga, Cadiz and Seville making the weekends a bit crowded but the weekdays almost empty! Hire a bike & enjoy the Andalucian countryside. Camaleon Sports in Novo Sancti Petri operate one day group bike rides ranging from 28 – 50 kms. You can take the ‘Route of the Bulls’ to the Medina Sidonia area, cycle to the beautiful Alcornocales Natural Park with its ancient oak forests, visit the Breña Natural Park near Barbate and enjoy the stunning views from historic Cape Trafalgar, or choose an easy half-day tour of the pine woods and cliff tops around Conil de la Frontera. You can also hire bicycles and go off on your own. Have you tried the fun of Quad Biking? Visit the circuit at Hipica Novo Sancti Petri only 1 Km from Casa de Alhambra to try out these All Terrain Vehicles. Enjoy the thrill of Go Karting at the Circuito de Karts. This coast is ideal for fishing. From the marina at Sancti Petri you can hire everything required for a day of open sea fishing. Swordfish fishing is most spectacular. From July to September swordfish are found in the Bay of Cádiz. There is also tunny fishing in the open sea around Barbate, Zahara or Conil. The sheer diversity between temperatures, salt contents, currents and natural environment of the straits of Gibraltar make this a fantastic place for Whale and Dolphin watching. If you want to know more about Whales and other cetaceans organise a trip to see them for yourself. take a Dolphin safari either from Puerto de Poniente at La Línea next to Gibraltar or from Gibraltar itself or Tarifa. This area boasts Donana National Park a world heritage site and Los Acornocales Natural Park , area teeming with bieds and reare European wild life.